What we have there, in a rough left to right order, is: Camera is an FXT Venus Pro. 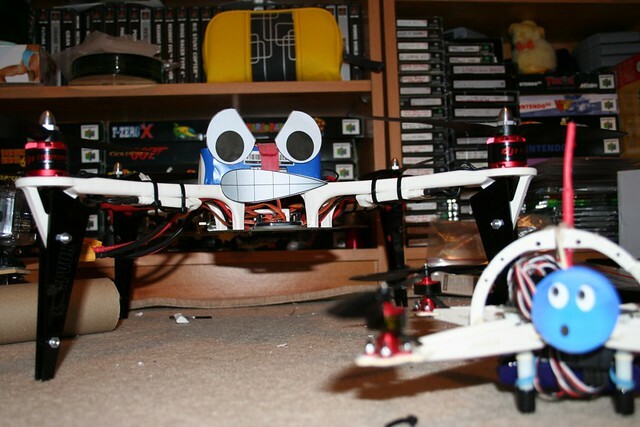 It was a review item, and so has already been flown on a quad. Little CMOS camera, gave a nice image. The flight controller is an Omnibus F4 with iNav having been flashed on it. That came out of an old quad, but seems ok. Above that is an AKK "Ultimate" VTX on the basis that it would stack and support SmartAudio. Next a Skywalker 50A ESC, just above that a GPS (an old one I had laying around from an old MicroMinimOSD project). Next an X4R RX (because I had a few around) and finally a T-Motor f80 2500kv motor. I tried to get a new motor here, but everyone seemed out of the 2500kv so I pinched this off the MRW. If you are wondering "why a jst connector" it's because on a plane I seem to want to be able to unplug everything and so I soldered in some connectors on the FC as well in case I needed to disconnect things. However, this became an issue as I had to use a reasonably big standoff to raise the PDB over the wing connector, and then the FC on this with the connectors facing upwards (doh, should have used a 90 degree angle) meant that I couldn't fit the VTX on top. In fact, I needed to bend my pin headers into something like 90 degrees just to fit the servo connectors in place. Luckily I had a few spare VTX's laying around, and even had a non stackable AKK VTX which used the same connector. I always set out with good intentions to make things tidy, but the idea of being able to disconnect things (for whatever reason) meant it's all a bit wire crazy and a few components are kind of floating around a bit. No matter, once you put the top on a use a few cable ties, you can hide away that mess One initial problem that I had was the amount of sats I was getting seemed slow and easy to lose. I think this is down to the proximity of the RX and the GPS. I've had this with FrSky telemetry RX's before that they can seem to wipe out the GPS, so I've reconfigured it so the GPS is out a bit more remote from other stuff. I'll go out and check that can pick up its sats before making sure I can balance the wing out on it's CG. The battery has a lot of space to move around at least though. That's one disadvantage to the build I guess, could be a bit of an interference nightmare, but being essentially a mini quad frame should be easy enough to get around. Apart from the slab of a lipo completely blocking 3/4 of the GPS antennas reception that is. You could, of course, do the normal thing of putting some components in the wing... specifically the RX in one, and VTX in the other, but then you have a slightly more complicated story should the wings want to disconnect in a crash. In a similar way to a mini quad, this isn't going to be used for any distance, so hopefully the big lump of wiring isn't going to cause to many issues.